Although the classical authors were agreed in ascribing the third pyramid at Giza to Menkaure, this was only confirmed early in the 19th century (1837-38) when Colonel Howard Vyse found the king's name written in red ochre on the ceiling of one of the three queens' subsidiary pyramids in Menkaure's complex. The lower courses of the outer casing of the pyramid were of red granite from Aswan, much of which survives today. The upper casing blocks were of gleaming white Tura limestone: a striking contrast. 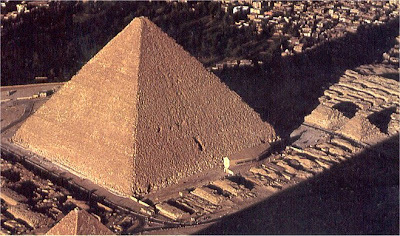 Although the pyramid was eventually 228 ft (70 m) in height, even this was an expansion because the original plan had been for a structure only about 100 ft (30 m) tall. This plan included an entrance passage on the north face just above ground level, but when the structure was expanded to its present form, the entrance was covered up. A new entrance was thus made on the north face, and what was originally intended as the burial chamber now became simply an antechamber. When Vyse entered the burial chamber he found against the wall an uninscribed and lidless basalt sarcophagus which was carved with the early Old Kingdom pattern of the articulated palace facade. Inside it was a wooden anthropoid coffin bearing the cartouche of Menkaure. The shape of the coffin was wrong for the period because coffins were rectangular in the Old Kingdom. It would appear, therefore, that the coffin and almost certainly the carved sarcophagus itself were pious restorations carried out during the Saite Period in the later 6th and 5th centuries BC. Both items were shipped to England, destined for the British Museum. Fortunately, they travelled in separate ships: the coffin reached the Museum, but the ship carrying the sarcophagus sank in a storm in 1838 shortly after leaving Leghorn. Efforts made in recent years using highly sophisticated technical equipment have failed to locate the ship. From 1905 to 1927 the Harvard University/Boston Museum expedition directed by George A. Reisner worked on the pyramid site, clearing the valley and mortuary temples. Reisner found some truly remarkable slate statues in the valley temple that included the splendid triad groups of Menkaure accompanied by the goddess Hathor (given the features of his queen, Khamerernebty II) and a nome deity, and also a magnificent dyad statue of the royal pair. Curiously, far more statues survive of Menkaure than of his 4th Dynasty predecessors - in inverse proportion to the size of their pyramids. Although the representations have the typical ethereal god-like look of the Old Kingdom, they are portraits of the king, notable for his snub nose and slightly bulbous eyes. Four complete examples of the king standing with a nome deity survived and fragments of others - perhaps all the nomes were intended to be represented in a great series of slate triads. The quality of carving of this difficult stone is very high, as is the finish where it occurs - although the majority are in various stages of completion, lending credence to the story preserved in the legends that Menkaure met his death suddenly. Menkaure's chief queen, Khamerernebty II, was the occupant of the larger of the three subsidiary pyramids associated with his pyramid. Her impressive granite sarcophagus is still in the burial chamber. She was the eldest daughter of Khafre by his wife Khamerernebty I, who was a daughter of Khufu by an unknown queen. Clearly, the royal family was bound by very strong blood ties.